College, can be tough, can be lonely and may never seem like "home" probably at least not your first year away. Our boys are making the most of it and they say their college beds are actually more comfortable then home because they have the memory foam comfy pillow tops that are oh so cozy. However, in talking to them recently they said as much as they're trying to make it home and their dorm rooms as cozy as possible, it's still not home. Here is where mom comes in to send them a little bit from back home where they love. I absolutely love giving and receiving care packages and a couple of my dear friends recently told me I should do a post about that. But I don't have pictures of the ones I've sent already but I couldn't help but snap away to share this one with you because it's my favorite so far. 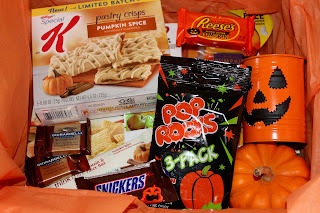 I've got one, who is as much of a pumpkin spice lover as I am, so I came up with the idea to do a pumpkin spice and everything nice care package! Filled the box with orange tissue and packed everything inside. 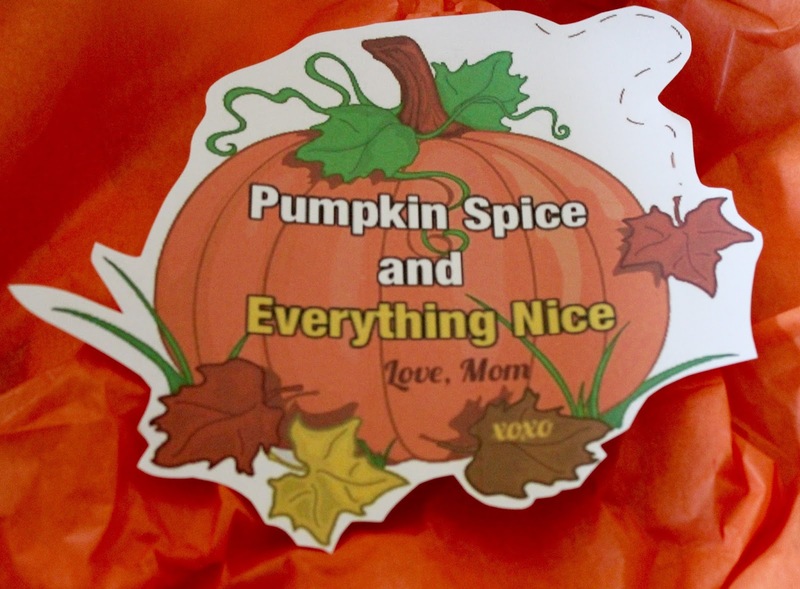 Found another pumpkin image and added my own wording with TitleX app or you can use PicMonkey, I put this on top of the folded over tissue paper. 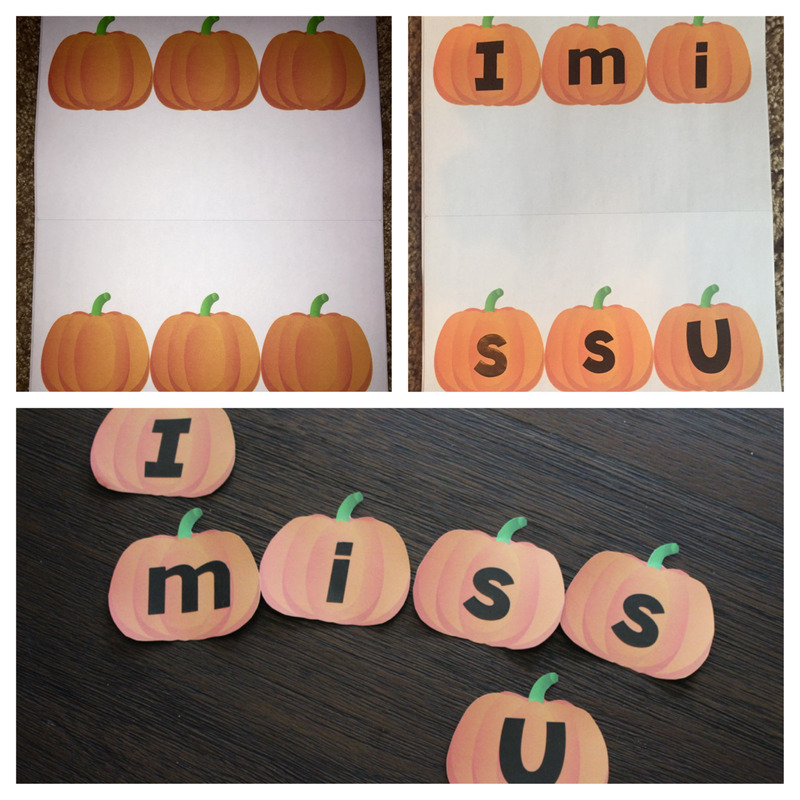 I also enlarged a couple of the lil pumpkins and added encouraging words and added some scrapbook stickers. I think it was a HIT, can you tell by this smile?? This quote below is my motto!!! Happy Monday. 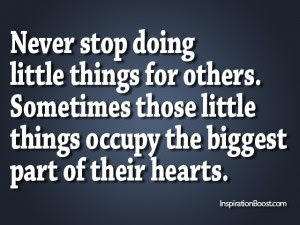 Do something small for someone this week and feel your heart and more importantly; their's.....SOAR!! What a cute care package! 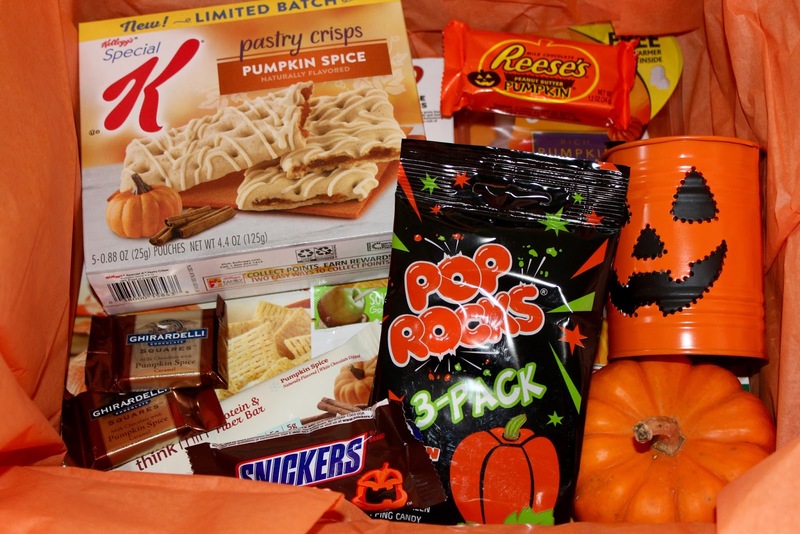 Love that it's filled with all pumpkin goodies! Your son looks so happy! Have a great week! That quote at the end is perfect!!! I love receiving care packages from my mom and you can tell how much he loved it!!! What a great idea !! I love this :) Your boys I'm sure miss you and dad and home !!! I know mine does ! These special little packages are such a great thought !!! Happy Monday ! My boy will be in Indiana Saturday to play some football :) We watched a little bit of Indiana's game Saturday - it should be a great game this weekend ! You nailed it! I know those boys were so excited to receive their packages! And I'm also liking that houndstooth chair behind that cutie, too! Been sick all weekend. Ugh! You'll have to read about it on my blog, but feeling better today, but I'm still sitting this day out in bed with magazines and books and lots of rest and liquids. Hope you're having a good one! You are a wonderful mom!!! My mom used to send me care packages when I was in college and she would wrap the boxes in colored paper and draw all over it! It always made me feel so special! Never stop sending those packages or little cards in the mail! You are such a sweet mom!!! Such a cute gift idea! I love the theme so fun and so fitting for fall! You are so sweet! Happy Monday! Awwww...so so sweet! Of course they had to have loved opening that - I wonder how long the treats lasted???? Ohh Andrea!!! This makes me sad to even think about my girls going away to college already! And I still have several more years. What an amazing mom you are to send these care packages to them. I'm sure they appreciated them so much, and you packaged it all up so nicely! Awwww.... You are the best mom! That's such a great care package! I love the photo of your son holding the package! This is the cutest idea--you're the sweetest mom ever! Can I just say that I want every single thing in that care package?! It looks so yummy! My Mom would do this for me too when I was away at college! And I have to tell you, it was such a special feeling and all the kids were super jealous! You're such a great Mom, who's obviously so talented at making the cutest care packages!! 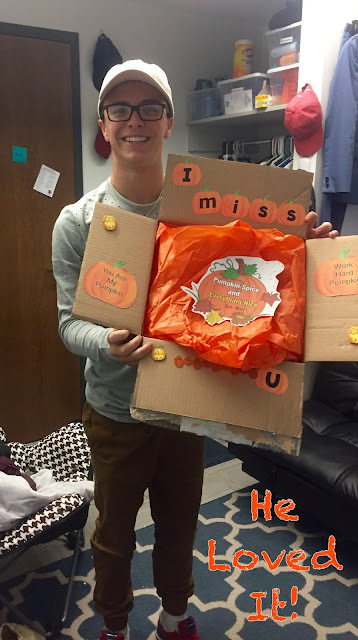 What a sweet care package to send to your sons, Andrea! I always would get so excited when my mom would send something when I was in college -- it's always nice to have something from home when you are away at school. 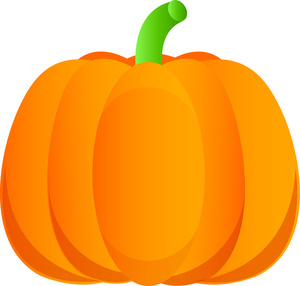 Love the pumpkin spice theme, too. Hope you have a great start to the week! Looks cool!!! I love Halloween celebrations! This could be the sweetest thing ever! Love that he even took a picture with it :) You are really the best Mama around. How sweet!! Care packages in college were always the best! What a good idea! I always loved it when I got a care package. So sweet. 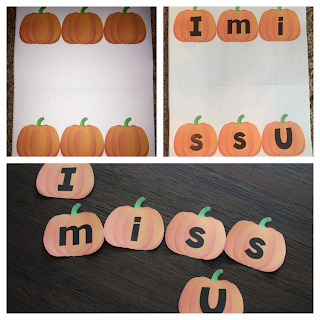 How fun to make it pumpkin themed. There is nothing better than getting a care package when you're away at school. This one looks super fun (and delicious!) and it looks like he really enjoyed it. What fun! Awwwwwwww this is so sweet!!!!! You are just the best mom sending your boys these care packages. I know they probably appreciated it so much! I love all the things you thought to put in them. Awwww...this is such a sweet idea! And his smile...contagious! I swear you have the most handsome boys! 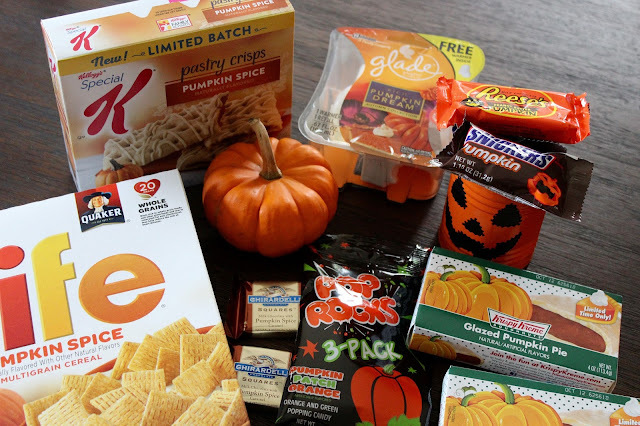 I would love a Pumpkin Spice package...give me ALL the pumpkin. Haha! I hope you have a fabulous day, my friend! Yay, so glad you did the care package post! I love your love for pumpkin spice. His face does say it all, you are such a sweet, thoughtful momma! That is such an awesome package! You did an amazing job on it & that smile definitely had to make it all worth it. I love sending care packages. Aww, you are BY FAR THE BEST MOM EVER! Your son's are so blessed to have you! Love your car package and the quote is just perfect! Thanks for sharing, Andrea! That is the cutest idea!!! I am totally stealing it! What a perfect care package. You are so creative!! Amen to doing all the little things for people. Love that you did this for your son and it speaks volumes to you as a mom. Aww your the best mama ever and I'm sure it put a huge smile on their faces to get some treats from home! Are your two boys at the same college or different ones? Wow! What a great package! And you are a great mom. I fail at the package sending! This is such a great idea for a fall care package, and I'm so glad that your son loved it! I know that I really enjoyed getting all of the care packages from my mom because they really did remind me of home! Love this care package Andrea! My son was here last weekend, and when I mentioned packing to go back home, he said college is definitely NOT home. I've loved putting together care packages for him - I think I have as much fun preparing them as he does receiving them. You're such a great mama! Andrea, that is the sweetest thing ever! I remember getting mail in college, it's like winning the lottery! I bet those Glade Plug-in's are impressive when he has friends over, too! Oh that is so sweet! I missed you at the Fancy Friday linkup! You were being featured! Oh this is awesome! Who wouldn't love that package? Great job! So sweet! I mailed a care package to some sweet cousins yesterday and am delivering one to my niece and nephew today! :) I just love sending some happy mail. OMG - sweet mama . . . this post just melted my heart! 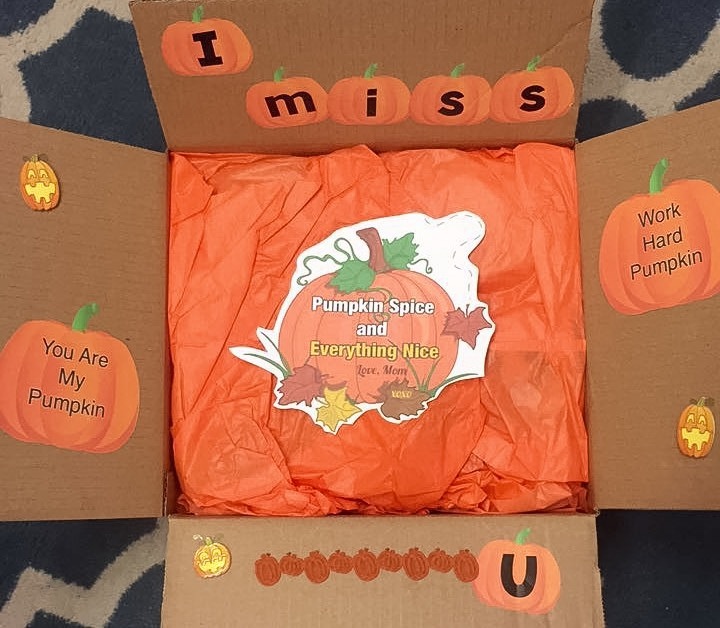 I adore your care package ideas and I'm saving this one because I love it so! Your baby look so happy and I bet it was such a welcome treat in his life! You're such a great example of how a mom should be . 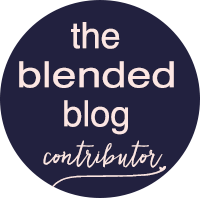 . . love seeing your life on the blog! Oh my goodness, you are just the sweetest momma! I'm sure your boys just loved this! Made me smile. I did things like this for my daughter when she was in college too. Thanks for sharing this idea with us at Merry Monday. This is such a wonderful idea! 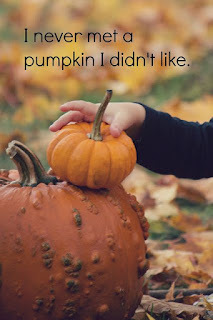 I love the fun twist with the pumpkin spice. Yummy! Thanks for sharing with us at The Wednesday Showcase! LOVE it! He must have too by the smile on his handsome face. I love how made a theme and stuck with it! Perfect for fall!